On Storage it comes with a 4GB LPDDR4x RAM with 64GB storage, 6GB LPDDR4x RAM with 128GB storage, and 8GB LPDDR4x RAM with 256GB storage expandable memory up to 2TB with microSD. Dual SIM device runs Android Oreo with ZenUI 5.0. In terms of Camera it has a 12-megapixel rear camera with support for OIS, Sony IMX363 sensor and 0.03s Dual-pixel PDAF along with AI scene detection to detect 16 type of scenes automatically, has a secondary 8-megapixel rear camera with 120-degree wide-angle lens for portrait shots and shoot images with a wider view. It also has an 8-megapixel front-facing camera with auto portrait and Selfie panorama modes and has Face unlock apart from fingerprint sensor on the back. 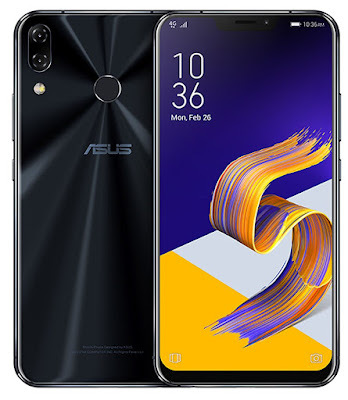 Asus Zenfone 5Z comes in Midnight Blue and Meteor Silver colors price starts at 479 Euros and will roll out from June.